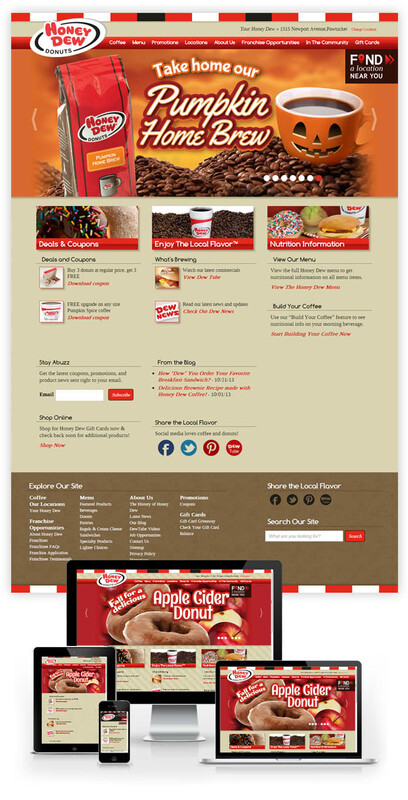 There are few things I like as much as coffee and donuts, so I was understandably excited when Envision began working with Honey Dew Donuts® in late 2012 on a complete redesign/redevelopment of the company's website and intranet. My role in this project was largely overall strategy and project management, but I also contributed the bulk of the design work to the project - including the visual design and layout of the site's homepage and key subpages. With the design work approved and ready to go, I passed the development aspects of the project onto the rest of the team at Envision. This development including using the ExpressionEngine CMS to power both the website and the intranet and EE's multi-site manager tool to connect the two deployments so that they could easily share content (menu item, store locations, etc.). Other exciting features that were added during development included the use of HTML5 geolocation to locate the nearest Honey Dew location to you, as well as a fully responsive site build to ensure that the new Honey Dew site would respond to, and work well on, the widest range of devices possible. All in all, this was one of the most enjoyable projects I have had the pleasure to work on in quite some time. Great people to work with, a fun and exciting brand and product, and challenges that we were able to meet through the use of innovative solutions and tools - this project really did have it all! Plus, it had donuts. You can't go wrong with donuts. You can see the new site at www.honeydewdonuts.com or read more about this project on Envision's Project Spotlight feature.